“I think that in service to the principle of parsimony, preferring the simplest explanation, these things [beings encountered in DMT space] must be human souls. Posted in Cannabis, Consciousness, DMT, Eschaton, Psychedelics, Terence McKenna (mp3) and tagged 2012, Cannabis, Consciousness, DMT, Eschaton, Psychedelics, Terence McKenna. The Art of Seeing. I see you have joined in on some warty theorems. This last one of the series is particularly awesome, you are right, Lorenzo. Now, have you looked into the connection between HalfPastHuman (Clif High’s ALTA reports) and the Timewave? The Hive-mind? The AI on the web collective tracing out the future? Absolutely incredible. I know for a fact that if TMK were still around, he’d hang out with Clif High most days. He probably would have had a LOT to do with Clif’s unbelievable web bot technology. Lorenzo, and much thanks for putting out these tapes that keep popping up. This one was better than anything the so-called Deep Thinkers come up with. Please promise to podcast whatever comes your way, okay? It is impossible to listen to anybody else after TMK, so please, hurry for the next series. 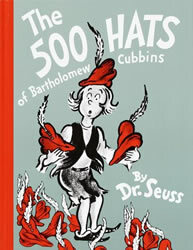 E-book version of The 500 Hats of Bartholomew Cubbins. It’s copyright 1938 so I’m pretty sure it’s safe to share. You only got 28 years back then. I Could be wrong. I couldn’t find a digital copy of The Art of Seeing. Wait your turn at rapidshare if you are not a member. Re-click and eventually you will be rewarded. Hey Matt, thanks for the 500 hats, can I have one now? Cool! Thank you for sharing. I sure can’t afford a 20-30 dollar hard copy from amazon. I’m looking forward to reading it tonight. I’m extremely curious to know more about what Terence said re: certain sects of Buddhism believing that if one being can become enlightened, then every living being in the universe also becomes enlightened simultaneously. Does anyone know which he is talking about, or which carry such a belief? Lorenzo, I sense you sometimes feels pressured to come up with new materials for your fellow tribespersons. Could be totally wrong on that . Being arrogant & lazy I have a suggestion for gobs of new content to nourish the godlet in all us tripping apes. There’s an online app called LibreVox ..a pile of free audio books. Anyone can go there and snag a specific audio book titled …Mysticism: A Study in Nature and Development of Spritual Consciousness by Evelyn Underwood. If you like McKenna’s precision and breadth , you might enjoy this book. Starts out sounding uber-Catholic, but it branches way out soon enough. In listening to this audio book I often experienced pleasant resonances of Terence. And she kacked 50 years before Terence did. Timelessness is a good sign. Keep going Lorenzo. We love what you do. April 8, 2010: … I just discovered, quite bu accident, that I had never added my introductory remarks to the beginning of this podcast when I was doing my final processing. Interestingly, nobody noticed, or if they did notice, no one told me 🙁 … My face is red. … But I’ve fixed it now. The main thing you missed is my thanking Brett J. and Perry B. for their donations. I’m really sorry about that guys, and I sincerely appreciate your donations.